Imagine living your life in a box. You wouldn’t be able to move around nor see outside. It’d be dark, narrow, and confining. The need to escape would be shooting from every cell in your body. Tightly bound with lock and key, pushing to escape proves futile. Fresh air quickly diminishing while your eyes focus on the small slivers of light beaming in from the outside world. It feels suffocating. Restricting. 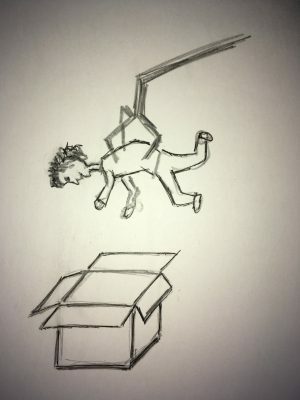 Being put in a box has the same sort of effect. Classified, square, predictable. And diminishing in every aspect. Coming with a label, your very own name highlighted right above the boxes contents. The packager knows with a certainty that the contents on the inside would go unchanged. They know, because they put the subject in. The label on the outside matches exactly what is found on the inside. Firmly closed with a certainty. The future interpreted and classified, this way and no other. Rigid. Fixed. Stuck and permanent. For years, upon years, upon years. Unable to change. Unable to open. But constantly brought up, repeatedly reminded of. “I know what you’re like,” said with a persuading look. “I know who you really are.” Like a broken record. There is a story about a girl who decided to wear a red shirt. A color somewhat out of her character, but one that she had always wanted to wear but somehow lacked the courage. Red- vibrant and alive, stands out no matter who wears it. Immediately her friends flocked around, exclaiming not on how phenomenal she looked, but rather, how strange to see her clothed in such a bright color. “It isn’t like you to wear red!” they cry. What did this mean, she thought. Was she not allowed to wear red, to appear somehow different than yesterday? Boxes and comments can dwindle or empower. Like we are all little actors, playing to expectations that people have to be one way or another. Constriction felt on the freedom to be oneself, in whatever state. Not being permitted to change, grow or improve. Lacking the courage or wisdom needed to ask, the packager fails to inquire, ‘Am i misunderstanding or judging? Am I assuming? Perhaps taking something that is unrelated to me personal...?’ So many options yet boxes can run like an old habit unwilling to die. As exhausting and infuriating as it is, sometimes its easier to deliver said prophecy. If thats what you expect, then fine. Here you go. Delivered. Moving past such confines means granting yourself some grace. This sometimes means letting go of people once important in your life; a hard but sometimes needed necessity. Getting rid of the old, making room for the new. As if the box was graciously lifted off your head, theres a new sense of freedom and expression. Permission is granted to be in relationship with people who support us in all lights, the negative and positive. To be with people who do not hold us to the past but invite us into a better future, including, growth and change. Bestowed upon others, this gift can allow anyone to be unlike, or like, the person they were yesterday, without judgement or expectation. Discarding boxes. Reinventing. When that doesn’t work, there is the much appreciated phrase, “If you don’t like the expression on my face, then don’t look at it.” One never knows what someone is going through. Happy, sad, neutral, its keeping the boxes and judgements at bay, thoughts quietly tucked away in the back pockets. And frankly said, what other people think of you is none of your business. As for the boxes, they serve no one. Its time for them to be thrown out.